Mikayel Ohanjanyan was born in Yerevan, Armenia in 1976. He attended the Terlemezyan state College of Fine Arts of Yerevan (graduated with honors in 1995) and then the State Academy of Fine Arts of Yerevan, (graduated with honors in 2001). In 2000 he moved to Florence, Italy, entering the Academy of Fine Arts of Florence (graduated with honors in 2005) where he still lives and works. 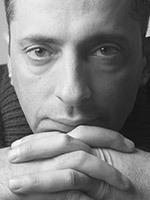 During the course of his artistic career, he has participated in various national and international exhibitions, such as the 12th Venice Biennale of Architecture in 2010 (National Pavilion of Armenia), 54th Venice Biennale of Art in 2011 (Collateral Event) and the 56th Venice Biennale of Art in 2015 (National Pavilion of Armenia), in which Armenia was awared The Golden Lion for Best National Participation. In 2016, the work "Diario" was selected for the Frieze Sculpture Park 2016, exhibited at Regent's Park in London and subsequently the same work was chosen for the prestigious Yorkshire Sculpture Park. In 2017, two works by Ohanjanyan were chosen for the Fiac – On Site project, exhibited in front of Petit Palais in Paris, France. Member of the Art for the World (Geneva), UNESCO’s International Association of Plastic Arts (Paris), Permanent membership at the Artist’s Union of Armenia. Ohanjanyan was awarded the Prix Henraux 2014. His works can be found at the Elesiastic College of the French Pontifical Seminar of Vatican (Rome), the Pontifical College of St. Roberto Bellarmine of Vatican (Rome), The Henraux Foundation (Italy), The Targetti’s Light Art Collection (Italy), The Microcolection Museum (Italy), The Collection of Municipality of Neustadt an der Weinstrasse (Germany), The Museum of the Centro Dantesco of Ravenna (Italy), The Museum of Contemporary Art of Pavia (Italy) and among private collectors in Armenia, Italy, France, Germany, Canada, the Netherlands, Belgium, Turkey and USA. Rare and as such precious, are those moments when – by means of silence, reflexion or estrangement due to the experience of a journey, physical or spiritual – one can allow to emerge sounds and forms of those forces, internal or external, which persist in our daily lives. Often not perceptible, but still concrete they take form, in time and space, thus physical traces of our experience, and they transform them into action. By means of his opera Mikayel Ohanjanyan analyses and visualizes the forces and relationships that are imminent in the individual and in the society transforming fragments of chaos into constructions of momentary equilibrium. Those forces are in continuous mutability, often characterized by contradictory tensions, elements capable of challenging set rules and visions. Thus the cube – simple and modular form par excellence, equal to the human body, the Cube-Monade – now appears open and contracted in its structure by a series of fine threads that connect it with other internal unities; thus being incised – in its wholeness of solid matter – provoked by the attraction towards external elements. The historical, artistic and philosophical memory gives substance to the opera of the artist who continuously questions the acquired rules in order to thereby create new ones concerning concept and matter and all this with abstract sensibility and infinite poetry. This work is inspired by the Armenian epos Sasna Tsrer (“Daredevils of Sassoun”) which tells the story of four generations of heroes. I am particularly fond of the last hero Pokr (little) Mher. In the last part of the epos we learn that the hero, after his numerous epic enterprises and tired of the unjust world which could no longer bear the burden of his legendary horse nor of him as a hero, goes to a place called Agravuqar or Vana Qar, also known as the Door of Mher. With his shining sword he opens the Door to enter and enclose himself in the rock, awaiting the day when he will come back out. I find this tragic story extremely contemporary, one in which a concentration of values is shut into a “place” waiting to burst, in order to project and contaminate both presence and future. 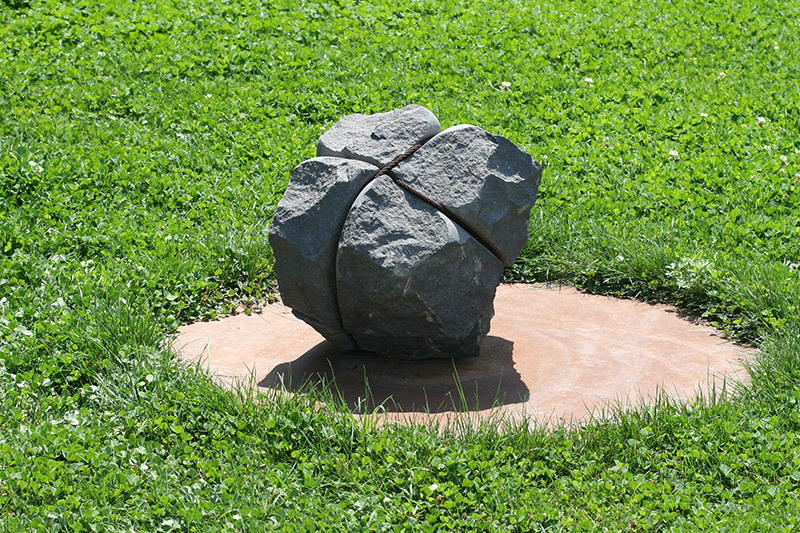 The work consists of four blocks of basalt, metaphorically, North, South, East, and West. Each block is itself split into two parts held together by steel cables. Texts will be carved into the cut surfaces of the stones, perceived only at the edges of the blocks that are placed and fastened intentionally askew, revealing the texts yet making them unreadable. The texts speak of a message left by Mher to future generations, where he invites the human being to not wait for him to exit from the rock, as told by the Epos. He states that he has been enclosed through the ages within the interior Agravuqar in each of us and will emerge when we have the courage to look and learn to delve deep inside ourselves. He says that only when we are able to find and stand before our own rock, will there then be the Order for him to emerge. With this imaginary message, I want to invite the visitor to reflect on the values that we hide within us and their indisputable importance in the relationship between I - Others and Others - I. One has the sensation that these blocks were hiding something special and profound, something luminous and yet invisible. The work is full of not only the physical but also the psychological in its tension between the written and the material, between dream and reality, between interiority and exteriority. The visitor walks across the space created by the four doors, entering into a dimension of contemplation.